Over the last ten days or so a lot has been going on. When that happens it’s hard to keep up. It’s actually hard to even think about blogging. However, I know a year from now or another year I may want to look back and thus …….. it eventually becomes catch up time for the blog to go on. We had never been to Ocean Shores or that area before. 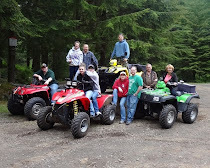 With a small family get together just around the corner, we headed south from Forks, Washington in that direction. The first few days we stayed at the Thousand Trails RV Park. As luck would have it, we pulled into one of the few full hookup sites. Our time there was spent checking out the area, driving on the beach and visiting a few of the local restaurants. Our favorite restaurant was the Irish Pub in town, Galway Bay. Friday (August 1st) rolled around and it was time to move on down to the Beachwood Resort in Copalis. They don’t really have accommodations for RVs but they went out of the way to be sure we had a place to park and hookups. We tend to have a family get together once a year. This event is usually held in Port Angeles because that’s where most of us were born, where we grew up and where many still live. Having it in Ocean Shores was a definite change. We knew it wouldn't be as big a group but we were really ready for a change. Getting together with family has to be a priority in order to keep the bonds tight. It's important to some and not so important to others. A bunch of us headed for the go karts. This year it was a good group. A lot of fun activities were planned. Major competition at the pool table. I did not win. If they had offered a last place award, that would have been mine! There were a few trips to the casino. Our grandson, Michael, celebrated his 21st birthday. I felt it my duty to acquaint him to the downfalls of the casino and I think I succeeded. However, it would have been nice to be winners but we weren’t. Many walks were made on the beach. Sunday we all moved out. Some headed towards Seattle and others headed south. We headed towards the Kelso Elks. This is where Terry would be hanging out until I got back from my trip to Hawaii. First, we had plans for a birthday dinner with family. We had a few birthdays to celebrate and we were heading to the Parker Steakhouse in Castle Rock. We had been to the Parker Steakhouse in Longview before they closed it down. We used to love that place so were hoping their other restaurant was just as good. Our Hawaii trip wasn't to be a long one but just a short break. Tammi had a business trip planned and I figured I'd play while she worked. Getting over there was not going to be a problem since I actually broke down and “bought” a one-way ticket on Alaska Airlines. However, I had no idea about plans for returning. The flights I checked looked full so I figured I'd just “wing” it. It was on the way to the airport that I received the little text from Sandie warning us that two hurricanes were heading in the same direction we were. For a few minutes we contemplated whether we should go or not. Tammi would have cancelled had she not had a tag along .... me. So, everything after that point tended to be my fault. ......... to be continued after I finish sorting pictures. whoever you are, you need one." I really like your final quote. HAHAHA...the header is a hoot. I remember your Texas theme reunion last year. It is nice to mix it up. Looks like a wonderful reunion...yet again. Of course it is your fault. Who else does Tammi have to blame? So, why can't they be hula boys instead of hula girls? Think you are having way too much fun, just like you should do. Is it because you actually bought an airline ticket? I've never regretted making time for a family gathering. It doesn't take a lot of time to keep those bonds strong, but it is such important time. Looks like a wonderful spot and lots of fun. Love the low tide shot, the colors are so calming :-). Looking forward to the hurricane-Hawaii post! All I can say is it looked like another wonderful family reunion with lots of fun!